Source: Kaval Wireless Technologies Inc. The BACKPACK 800 MHz series BDA is a compact bi-directional broadband linear amplifier for the 800 MHz Trunking and ESMR band. It is an ideal platform for extending two-way voice and data communications such as analog and digital trunked radio services. The series is based on the company's latest developments in advanced digital gain control featuring precise gain control in both up and downlink paths. 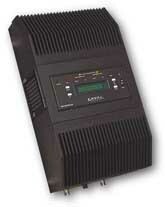 The amplifier features 65 dB of gain with an IP3 level of 45 dBm. It also includes the company's Microprocessor Control feature.  Compact Size: The unit is self-contained and includes amplifiers, heat sink, power supply and chassis. It also includes the Microprocessor Control module and is mounted in the center of the unit for easy access.  Gain and Power Flexibility: The unit features 65 dB of gain with an IP3 LEVEL of 45 dBm.Up to 31 dB of gain control is available in 1 dB increments.  Linear Amplification: It is capable of passing analog and digital trunking protocols in the 800 MHz Trunking and ESMR band.  Modular Design: The unit features plug and play modules and components.  Housing: It is constructed of durable steel with protective black coating. The housing is wall mount capable for easy installation and servicing. Kaval Wireless Technologies Inc., 60 Gough Road, Markham, ON L3R 8X7. Tel: 905-940-1400; Fax: 905-940-1402.